A 60-year-old man presents with rapidly growing lesions on his face, trunk, axillae, flexural areas, and groin. The lesions appeared 3 months earlier in his perianal area and extended rapidly to other areas. Previously, he was treated with topical agents for atopic dermatitis and seborrheic dermatitis without improvement. Examination reveals disseminated violaceous papules and plaques on the face, trunk, axillae, and perianal area; some lesions were confluent and ulcerated. Yellowish-red to skin-colored papules are present on the scalp. He has no palpable lymphadenopathy or organomegaly. Cutaneous LCH is diagnosed through a combination of clinicohistopathologic features and immunohistochemical stains for the S100 and CD1a proteins.4 Histopathologic findings of the lesions should show diffuse infiltration of large tumor cells with grooved kidney bean nuclei and a moderate amount of eosinophilic cytoplasm in the dermis.6 Equivocal cases can be diagnosed via electron microscopy demonstrating Birbeck granules or through immunohistochemical stains for Langerin (CD207), a monoclonal antibody that is associated with Birbeck granules.4 The differential includes seborrheic dermatitis, prurigo nodularis, eczema, and nutritional deficiency dermatitis, which may be distinguished from cutaneous LCH via histology and immunohistochemistry. In our case, because the patient was diagnosed with widespread cutaneous LCH, he was treated with a course of oral prednisone along with methotrexate. After this single course of therapy, the patient achieved nonactive disease, which continued through his 3-year follow-up visit. Melinda Liu, BA, is a medical student and Maura Holcomb, MD, is a dermatology resident at Baylor College of Medicine in Houston. Simko SJ, Garmezy B, Abhyankar H, et al. 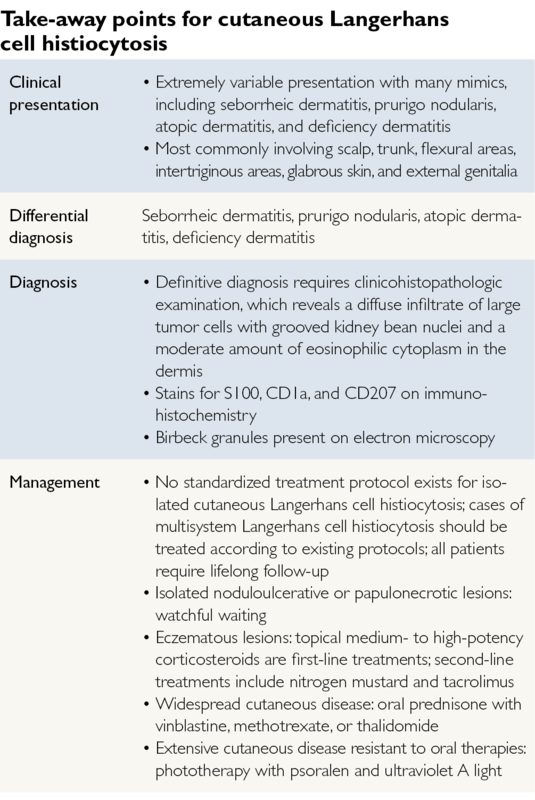 Differentiating skin-limited and multisystem Langerhans cell histiocytosis. J Pediatr. 2014;165(5):990-996. Morren MA, Vanden Broecke K, Vangeebergen L, et al. Diverse cutaneous presentations of Langerhans cell histiocytosis in children: a retrospective cohort study. Pediatr Blood Cancer. 2016;63(3):486-492. Subramaniyan R, Ramachandran R, Rajangam G, Donaparthi N. Purely cutaneous Langerhans cell histiocytosis presenting as an ulcer on the chin in an elderly man successfully treated with thalidomide. Indian Dermatol Online J. 2015;6(6):407-409. Ng SS, Koh MJ, Tay YK. Cutaneous Langerhans cell histiocytosis: study of Asian children shows good overall prognosis. Acta Paediatr. 2013;102(11):e514-e518. Langerhans Cell Histiocytosis Treatment (PDQ®)-Patient Version. National Cancer Institute website. https://www.cancer.gov/types/langerhans/patient/langerhans-treatment-pdq Updated October 3, 2016. Accessed November 3, 2016. Sun WG, Zhong LS, Chen H. A case of adult generalized cutaneous Langerhans cell histiocytosis. Ann Dermatol. 2016;28(2):262-264. Dodd E, Hook K. Topical imiquimod for the treatment of childhood cutaneous Langerhans cell histiocytosis. Pediatr Dermatol. 2016;33(3):e184-e185. Park L, Schiltz C, Korman N. Langerhans cell histiocytosis. J Cutan Med Surg. 2012;16(1):45-49.